“HP Labs’ research into printing of inorganic materials is working towards hybrid printing of glass (and other inorganic materials) onto items that are already mass produced,” the ad reads. With 90% of the earth’s crust composed of silicate minerals, there will be no shortage of silica resources. Glass is easy to recycle and is environmentally friendly. Glass is inexpensive but looks precious, is pleasant to the touch and is so familiar that customers will not be disappointed by its fragility— under certain conditions. 3D printed glass. Photo by HP Labs. There is more than one way to make glass, and the 2012 paper indicates that HP is interested in adapting more than one to 3D printers. Printers could, for example, replace the need to create a mold. Glassworkers could use a 3D printer to build a glass shape–as complex as they wish–and then fire it in a kiln. 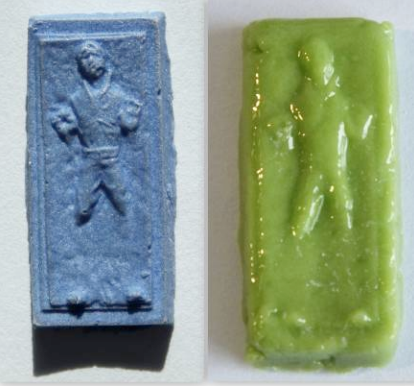 But the ad calls for 3D printing on objects that were previously mass-produced. It’s not clear what that means exactly, but electronics come to mind. 3D printing could provide a relatively cheap way to add glass to complex shapes. HP is due to release its first-ever 3D printer in October. We don’t know much about it except that it will be aimed at businesses and a potential boost for the ailing company. It’s unlikely it’s a glass printer though. This is a project that still lives within HP Labs.